What Are Banana Pancakes (aka Banana Roti)? 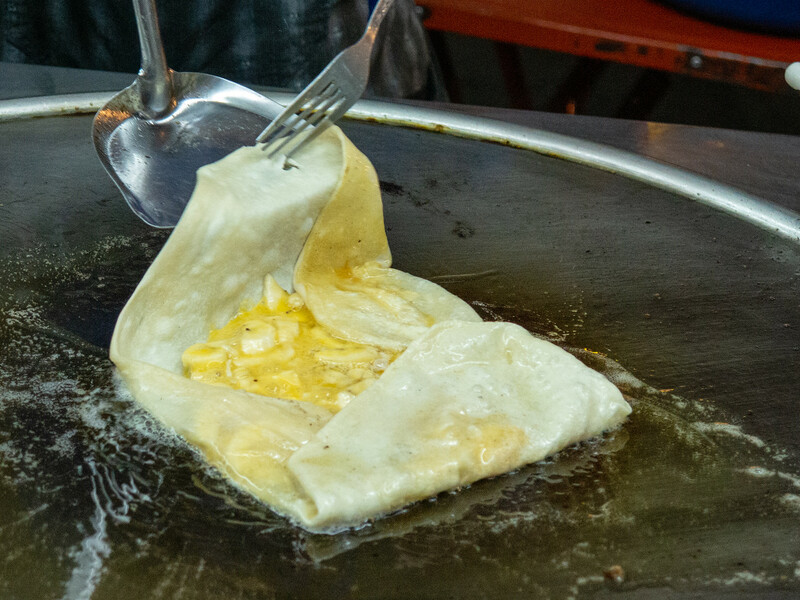 Banana Roti (or Banana Rotee) more famously known as Banana Pancakes always make a great finish to a night out eating street food in Thailand. It seems everywhere you turn there is another stall making these delicious treats. At a usual cost of less than a dollar, they are certainly affordable. How healthy banana roti are is probably another matter. I try not to focus on that so much. In Thailand roti generally refers to a type of Indian wheat flatbread known as maida paratha which is very similar to naan. Instead of baking the dough is pressed and rolled and slammed into something resembling a crepe. The dough is then put on a hot griddle with butter and oil and fried to a golden brown. 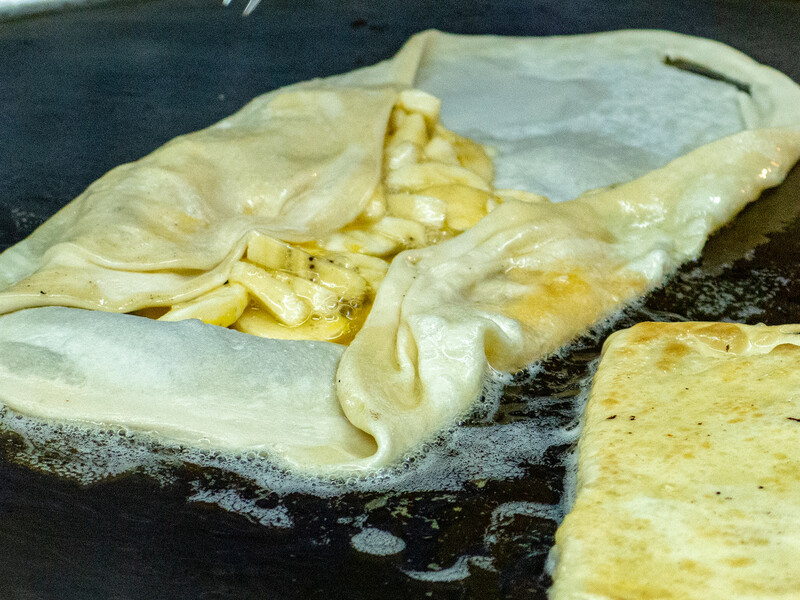 Bananas, sometimes mixed with egg (my favorite) are spread across the roti dough while it is frying and eventually skillfully folded inside. 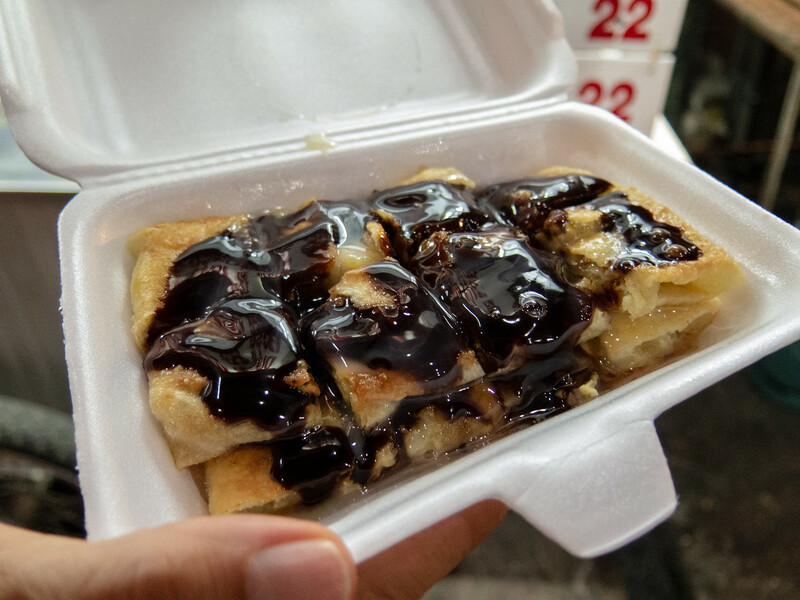 The result is then covered with condensed milk and optionally chocolate syrup or Nutella. This is the result! The finished Banana Roti is cut into pieces and you are given a sharp stick to spear the gooey pieces for eating. It sounds simple, and it is, but roti are an amazing treat. Why are Banana Pancakes so Famous in Southeast Asia? In the 60’s an 70’s, just as western “hippies” were beginning to “find themselves” and started traveling throughout Southeast Asia, entrepreneurial street food sellers began making this easy to create this treat to satisfy the palates of travelers looking for something approximating a taste of home. 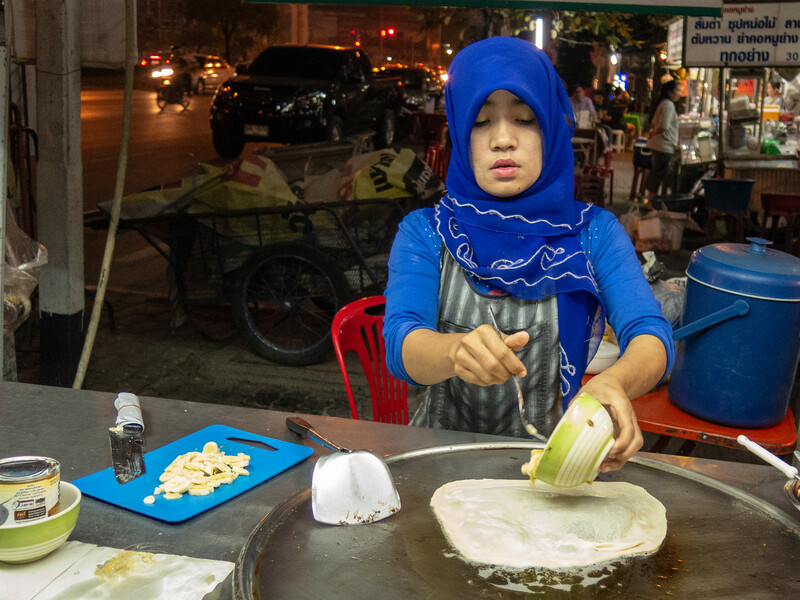 The Banana Roti is now so common the term Banana Pancake Trail has become an affectionate tongue-in-cheek metaphor for the “exotic places” western travelers frequent in Southeast Asia.